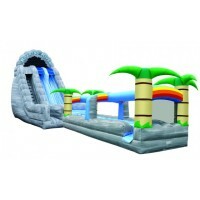 Our new 27ft Tropical Roaring River Slide features a radical sliding angle that is sure to get the adrenaline pumping. This water slide will absolutely blow your mind. Everyone loves this slide for its steep angled fun.